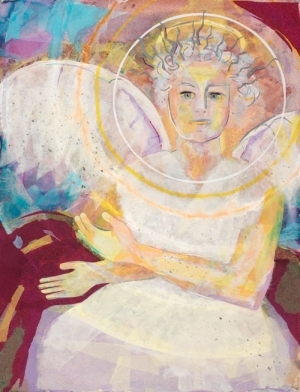 “The Angel” shows circles of energy/power radiating from the Angel’s face, in subtle rainbow colours, from white to yellow to orange, etc. The overall colour theme is white. our dread of dead ends. the new beginning in a dead end. and roll our stone back. to shake us open. AMEN.